A protest outside the Washington, D.C. home of Fox News host Tucker Carlson has lead to a criminal investigation from police. Twitter has suspended the anti-fascist group that promoted the protest and tweeted Carlson's address. About 20 protesters gathered in front of Carlson's home Wednesday night, chanting loudly and using a bullhorn, according to a police report obtained by CBS News. Carlson said he was at his Fox News office, preparing for his 8 p.m. show, and his wife Susie was home alone at the time. The couple's four children were not there. Carlson's wife said she heard "loud banging and pounding on her front door," the police report says. When officers arrived, they found politically-charged signs left on cars in the driveway, a sign on the front door and the anarchy symbol spray painted on the driveway. The police report describes the protest as "anti-political" and a "suspected hate crime." Police are investigating an offense of defacing public property, but the department told CBS News no arrests have been made. A group called Smash Racism D.C. posted messages on social media encouraging the protest and revealing Carlson's address. "Fascists are vulnerable. Confront them at their homes!" the group wrote in a Facebook post. In a tweet, Smash Racism D.C. said Carlson spreads "fear into our homes" every night and would be reminded "that you are not safe either." 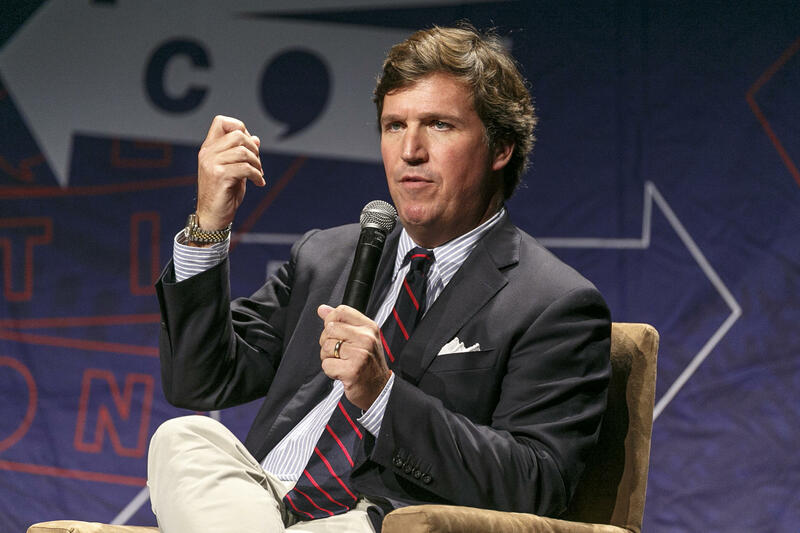 In videos posted on Facebook and Twitter, protesters are heard calling Carlson a "racist scumbag" and chanting, "Tucker Carlson, we will fight! We know where you sleep at night!" Carlson said in an interview with The Washington Post that the incident "wasn't a protest. It was a threat." He said someone "started throwing himself against the front door and actually cracked the front door." He said his wife, thinking it was a home invasion, locked herself in a pantry and called 911. "They weren't protesting anything specific that I had said. They weren't asking me to change anything," Carlson told the Post. "They were threatening me and my family and telling me to leave my own neighborhood in the city that I grew up in." Fox News issued a statement calling the protest "reprehensible." "The violent threats and intimidation tactics toward him and his family are completely unacceptable," the statement said. "We as a nation have become far too intolerant of different points of view. Recent events across our country clearly highlight the need for a more civil, respectful, and inclusive national conversation. Those of us in the media and in politics bear a special obligation to all Americans, to find common ground." Other news organizations, including CNN and The Washington Post, published op-eds condemning the protest and saying it went too far. Former Fox News host Megyn Kelly called it "stomach-turning," writing in a tweet, "This has to stop. Who are we? What are we becoming?" Smash Racism D.C. has helped organize similar protests in public and at the homes of other conservative figures, including Texas Sen. Ted Cruz and White House senior advisor Stephen Miller.